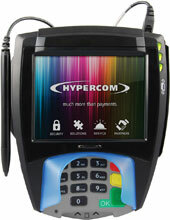 Hypercom L5300 - BUNDLE, TRANSACTION TERMINAL, SIGNATURE CAPTURE, MODULAR INTERACTIVE, INCLUDES USB CABLE, POWER SUPPLY. Requires key injection in order to accept debit or credit card payments. Please call for more information. 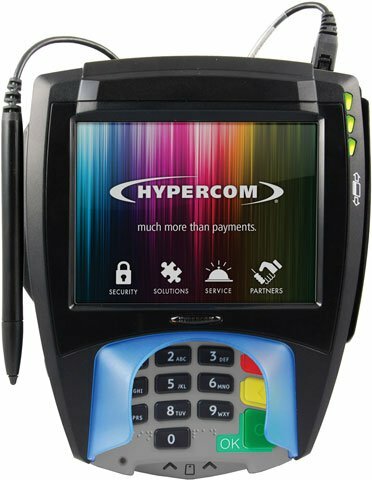 The Hypercom L5300 has an 18-bit (256K) color, full VGA (640 x 480 resolution), large LCD display, integrated capacitive glass touch screen, audio and video capabilities, and electronic signature capture. This allows the L5300 to easily support interactive marketing programs and in-line advertising campaigns. All of this packaged in a small footprint and light-weight design. The L5300 includes an integrated keypad with a non-removable rubberized privacy shield. Raised characters on keys were designed to address the needs of the visually impaired. An audio jack also allows for audible prompting using head phones to help meet Section 508 requirements. CABLE, MDIN9F TO RJ45 12IN BLACK (Adapter that allows connecting an L4xxx RS-232 cable to an L5000 terminal (Non-locking interface). The Hypercom BDL-HYP-5300-PUSB is also known as BDL-HYP-5300-PUSB	or BDLHYP5300PUSB	.